MISSOULA, Montana, April 18, 2012 (ENS) – Montana conservation groups Monday filed a second lawsuit against the U.S. Forest Service, seeking to protect the watershed of the Flathead River’s South Fork from two adjacent logging proposals along the congressionally-protected wild and scenic river. Friends of the Wild Swan and Swan View Coalition argue that this area is one of the last wild places in the lower 48 states. It has been designated as critical habitat for lynx and bull trout, and is considered essential to the survival and recovery of grizzly bears in the Northern Rockies. Wolverines and fishers, two rare forest carnivores, are known to inhabit the area. “Contrary to law and sound wildlife management practices, the agency has refused to consider the cumulative impacts on wildlife and water quality from the two massive logging projects even though they will be occurring simultaneously and are located next to one another in the same watershed and same grizzly bear management unit,” said Matthew Bishop, an attorney with the Western Environmental Law Center in Helena who is representing the groups. The Forest Service’s Soldier Addition II Project is located on the west side of the South Fork Flathead River near the Bob Marshall Wilderness complex in the Northern Rocky Mountains. The project calls for industrial logging methods, including ground-based logging, skyline logging, and helicopters, to remove almost all of the mature, 75 to 130 year old forest stands on over 1,200 acres in the South Fork that have never been logged. An additional 823 acres would be thinned and 1,333 acres burned. The project would re-open 14.6 miles of roads previously closed to protect wildlife and water quality, and would require the construction of another 5.6 miles of temporary roads to access the trees. At the same time, the Forest Service is proposing the Spotted Bear River logging project, just across the South Fork from the Soldier Addition II project, on the east side of the river. This project would log 1,853 acres of pristine wildlife habitat adjacent to the Great Bear and Bob Marshall Wilderness areas. In February, Friends of the Wild Swan and Swan View Coalition filed a lawsuit to stop the Spotted Bear project. The proposed industrial logging projects would not only harm wildlife, but would take a toll on the local economy which is based on the thousands of outdoor recreationists who visit the area, the two groups point out. 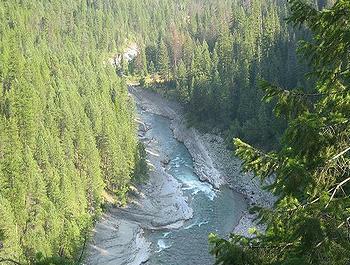 Hiking, camping, hunting, fishing, boating, rafting and other recreational pursuits are popular activities in the remote South Fork Flathead River area, which is also the gateway to the Bob Marshall and Great Bear Wilderness areas. The groups warn that industrial logging would disrupt recreation and create unsafe conditions on the reservoir roads.